The jet stream remains active for the Northeast with a powerful nor’easter continuing on Thursday then drier. Across the West there is one primary storm system for the weekend with potentially a smaller one taking a more southern track. Northeast: Heavy snow continues on Thursday at most of the ski areas. Leftover, wrap-around snow showers on Friday. That sets Friday up as a big powder day at Mount Snow, Catamount, Sugarloaf, Sunday River, Killington, Jiminy Peak and Ragged Mountain. Then drier conditions for the weekend. An Alberta Clipper with light snow accumulation possible on Tuesday. Pacific Northwest: I'm forecasting one storm system over the next five days. Heavy snow accumulation is likely on Thursday and Friday across the high Cascades and volcanoes. Drier Saturday-Monday. Another storm system is possible by Tuesday afternoon. Whistler/Blackcomb: I'm forecasting one storm system over the next five days. Heavy snow accumulation is likely on Thursday and Friday. A rain/snow mix is possible both days lower on the mountain. Then drier Saturday-Monday. Another storm system is possible by Tuesday afternoon. Colorado, Utah: I'm forecasting one minor storm system in the next seven days. Snow starts Friday night and ends by Sunday morning. Light to moderate snow accumulation at the ski areas. As a result, the best powder day occurs on Sunday after the snow ends. Wyoming, Montana, Idaho: I'm only forecasting one storm system over the next seven days. 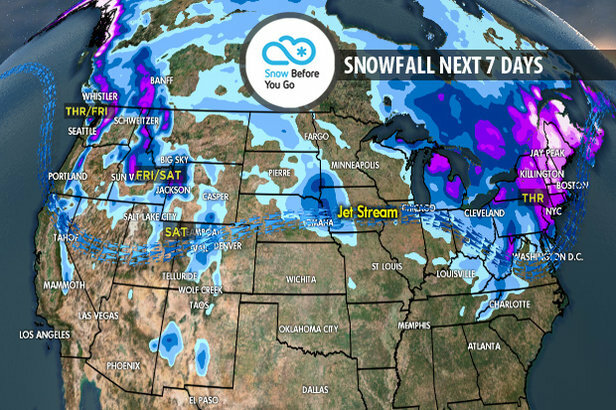 Snow starts on Thursday in Idaho and moves into Wyoming and Montana on Friday and ends on Saturday. Moderate snow accumulation at the ski areas with a few heavy pockets. A rain/snow mix may occur at the lower elevation ski areas. Drier Sunday-Tuesday. California: There are potentially two storm systems over the next seven days and both look warm. The first storm delivers snow in two waves, primarily effecting the Tahoe ski areas. The first wave hits on Thursday and the second on Friday. It's a rather warm storm system and it's likely to mix with rain cutting down on snow accumulation. The second storm system takes a more southern track arriving on Sunday. Like its predecessor, temperatures look warm with rain mixing in. Tomer's Take: Ski Friday in the Northeast at Ragged Mountain, Mount Snow or Sugarloaf. 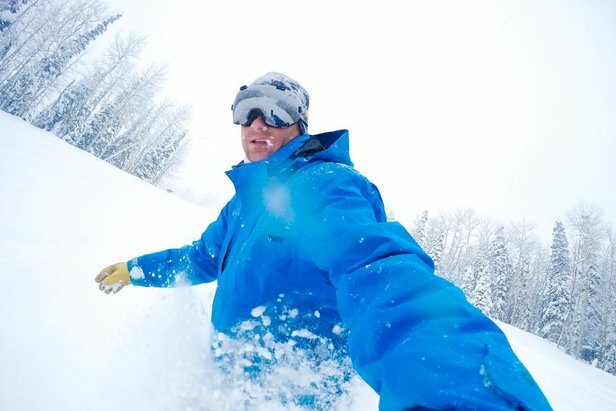 On Saturday ski Schweitzer or Sun Valley and on Sunday ski Jackson Hole or Loveland.